(Photo: © Peter Kenny)World Council of Churches General Secretary Rev. Olav Fykse Tveit addresses a press conference at the United Nations in Geneva on Dec. 12, 2016. 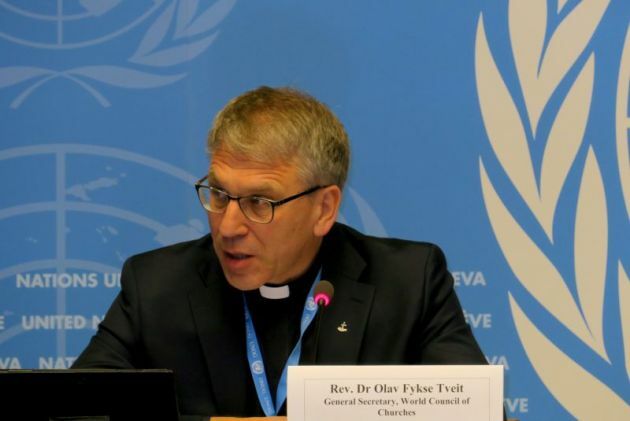 The World Council of Churches is in its 70th anniversary year, and the man at helm Olav Fykse Tveit believes humanity is in a time when the WCC's purpose and objectives "are relevant as never before." It's going to be a big year for the WCC, that represent more than half a billion Christian from mainly, Anglican, Orthodox and Protestant churches in every corner of the planet. Earlier this month, the Vatican and the WCC announced Pope Francis will travel to Geneva on June 21 to mark council's anniversary. The WCC said the landmark visit is only the third by a pope, and the first time that such an occasion was dedicated to visiting the WCC, which is based in Geneva. The council announced on March 26 that the latest issue of The Ecumenical Review, the WCC's quarterly journal is commemorating the anniversary by publishing an article, address, or book chapter by each of the WCC's seven general secretaries since 1948. "Each of the WCC's general secretaries was dealing with the issues of his time," writes editor Stephen Brown in the editorial that opens the issue that is titled, "Walking Together, Serving Justice and Peace." WCC general secretary Tveit, a Norwegian Lutheran theologian, writes, "Through the entire 70‐year history of the WCC, there has been a commitment to work both for the unity of the church and for common service and witness for justice and peace in the world." He also refers to the withdrawal of accountability for humanity's common home. "We are living at a very dangerous time in human history. "In January 2017, nuclear scientists moved the doomsday clock to two‐and‐a‐half minutes to midnight – they saw the world almost as close to a nuclear war as in 1953 when both the Soviet Union and the United States were testing hydrogen bombs in the earth's atmosphere." This was due to tensions around the Korean Peninsula threatening to get out of control. "Moreover, the denial of global warming and its consequences, and violence and war in the Middle East and other regions, are other factors darkening the horizon of the future of humankind," says Tveit. In contrast to this bleak picture, Tveit, however says more and more people are waking up. "They realize that this situation requires that they not remain silent bystanders, but instead express their hope for the life of God's creation through specific acts and actions turning the situation around," writes the WCC head. He notes that this is not an easy task, nor is it a comfortable journey. "This was a tough lesson we had to learn in the Program to Combat Racism. The struggle against racism also became a battle within and between the churches. The racial division of human beings created in the image of God also divided the church," he says.